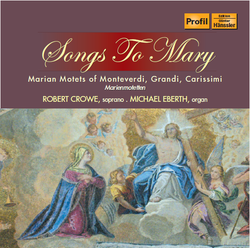 This selection of motets from the first half of the 17th century explores the various ways in which the Virgin Mary was viewed: as the Mother of Jesus, the Mother of God, and the Queen of Heaven. Included are the well-known motets: 'O Quam tu pulchra es' by Alessandro Grandi and 'Exulta Filia' by Claudio Monteverdi, as well as one of my favorite pieces of Christmas music ever: 'Salve Puellule' by Giacomo Carissimi. 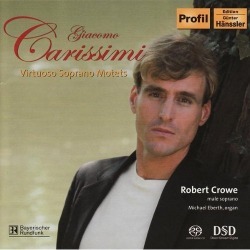 Michael Eberth is also presented in this CD in two fantastic organ solos by Frescobaldi and J. K. Kerll. This is sweet music, full of wonder, and awe. I hope you enjoy it!. Recorded February 1-5 in Munich in 2010. These four motets of Carissimi explore the gamut of emotions, from highest exultation to deepest personal despair. They also push the male soprano voice to its technical as well as expressive limits. These pieces speak to me, personally, on many different levels, musical, emotional, and intellectual. I have loved singing them, both for this recording, and in concerts in as disparate places as the Jesuit chapel in the shadow of the Bavarian Alps, where we recorded them, to the wood-beamed Presbyterian Church of Santa Fe, New Mexico, during a rare, desert thunderstorm. If I had a personal recommendation, it would be to not listen to them all at once, but rather take them one at a time, on different days. Oleum Effusum Est is my particular favorite.